The most basic portable power saw is a circular saw with a blade turning at about 5,000 rpm. Most of these saws can be equipped with a rip guide to maintain a uniform width of cut on long passes. Quality saws have an ejector chute which routes sawdust to the rear or to the side, away from the work instead of leaving it to obscure the cutting line. Saws are classified by blade size and duty ratings as to the jobs and applications they can be used on. Generally, blade sizes range from 5 1/2″ to 10″ diameter, with 5 1/2″ and 7 1/4″ the most popular. The greater the blade diameter, the thicker the material it will cut. Blades are made of tempered, tensioned steel, flat, hollow or taper ground, and are available for almost any cutting requirement. Taper or hollow-ground blades are machined so that the body of the blade passes through the cut made by the teeth without binding. This allows smooth cutting because the need for “set” on the blade teeth is eliminated. Teeth on flat ground blades are alternately set (right and left) to prevent binding by making the cut wider than the blade. Carbide-tipped blades last up to 20 times as long as ordinary blades and are useful if a great deal of work is to be done on plywood or hardwood. Technological developments in recent years have made the carbide coating even harder, giving extended working life to circular blades. These blades are not to be used on masonry or where nails may be encountered. Different types of abrasive cutoff wheels are used for cutting ferrous metals, masonry, glazed materials and ceramic tile. These wheels are attached directly to the saw in the same manner as a blade. Abrasive cutoff blades should be used only in saws with aluminum or magnesium guards. A two-in-one cutoff wheel is unlike the conventional rigid type and acts as all-purpose cutting and sanding disc. This wheel, consisting of resilient nylon mesh impregnated with silicone carbide grit, is flexible, shatterproof, and can be used for smoothing, shaping and cutting most materials. It also may be used as power drill attachment. The sabre saw has a small, thin blade that cuts with an up-and-down motion, making it ideal for irregularities and scroll work, as well as for ripping and cross-cutting. Units can usually cut through 1″ hardwood and 1 1/2″ softwood with no trouble. Quality saws include variable speed controls to accommodate plastics, metals, etc. In addition, quality units have larger strokes, often up to 1″ in stroke length; other quality features are provisions to narrow the slot in the shoe where the blade works to prevent splintering of the wood. A roller support behind the blade, counter balancing and orbited actions are other features found on heavy-duty versions. Special blades are available and may be provided with adjustable platform to allow cutting variations to 45 degrees. The sabre saw does not have the cutting speed of the circular saw and is more difficult to keep in a straight line. 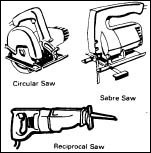 Good sabre saws will usually operate at up to 3,000 strokes per minute. A reciprocal saw is similar to a non-powered hand saw except that the blade moves back and forth under power. It is good for ripping and cross-cutting, but lacks the control achieved from the platform design of the sabre saw. However, the blade will reach into close areas where a sabre or circular saw would be unable to cut. Blade action usually goes to about 2,000 strokes per minute. The development of carbon-steel, high-speed bimetal and carbide-grit blades gives the reciprocating saw blade more versatility in the materials it can cut.